In mid-April 2015, my wife, Donette, and I made our seventh trip to the Central American country of Belize to continue our rock climbing project. In addition to developing sport routes, we have been teaching the local adventure guides how to rock climb. There are currently about 100 routes at 15 climbing areas in Belize, ranging in difficulty from 5.1-5.12a. Breakfast consisted of garnaches, which we purchased from a mother and daughter who set up a roadside stand. The garnaches cost “chree fi a dala” (Kriol for “three for a dollar”) and are best eaten immediately, as they get soggy if you wait too long. On the way to the crag, we saw a jaguarundi cross the road in front of us, which was the first we had seen in the wild. signs of Africanized (“killer”) bee nests. We then set to work on a 50-foot high overhanging wall that didn’t yet have any routes on it. We did an easy route (5.3) up the margin of the wall to access the top of the cliff. As I was drilling anchors atop what would be a new route, I saw a beautiful toucan in a tree about 40 feet above me. The wall overhangs about eight feet, so a bit of effort was needed to figure out where the bolts should be placed and to then get them installed. Temperatures were in the low 90s, so at midday, we swam in the nearby creek to cool off. By the end of the day, we had two new routes done – the left route had five bolts and a natural thread (5.10c/d) and the right route was protected by five bolts (5.10b). That evening, we had dinner with the guides who would be attending the rock climbing training later in the week. 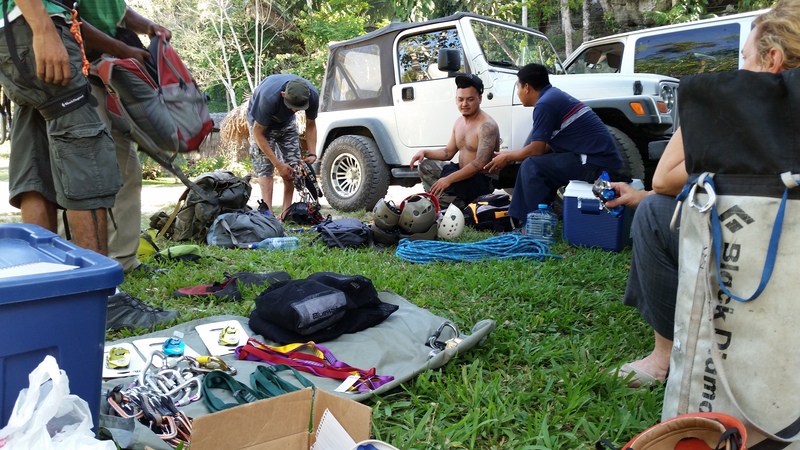 The training project has thus far introduced 31 Belizean adventure guides to rock climbing. Nine of those guides are now learning the skills needed to be rock climbing guides. This project is being done in conjunction with guides, tour operators and the Belize Tourism Board, who regulates and licenses guides in Belize. This most recent two-day training session introduced skills such as escaping the belay and ascending to a stuck climber. An added bonus on the first day of training was seeing a kinkajou in a tree just above the cliff – the first we had seen in the wild. Above: Sorting gear at the end of a day of training. Our next training will be this coming October, when two of the Belizean guides come to California. If you hear Kriol being spoken at the crag, you’ll know who they are!